Each of your groups of VIPs is so important, they all get their own post. This post is about your Benefactors. Benefactors are people who will pledge more than $500 to your campaign. And that $500+ is often for something intangible with low cost to produce. Sometimes, this money is truly a gift, a financial offer of encouragement for your project. 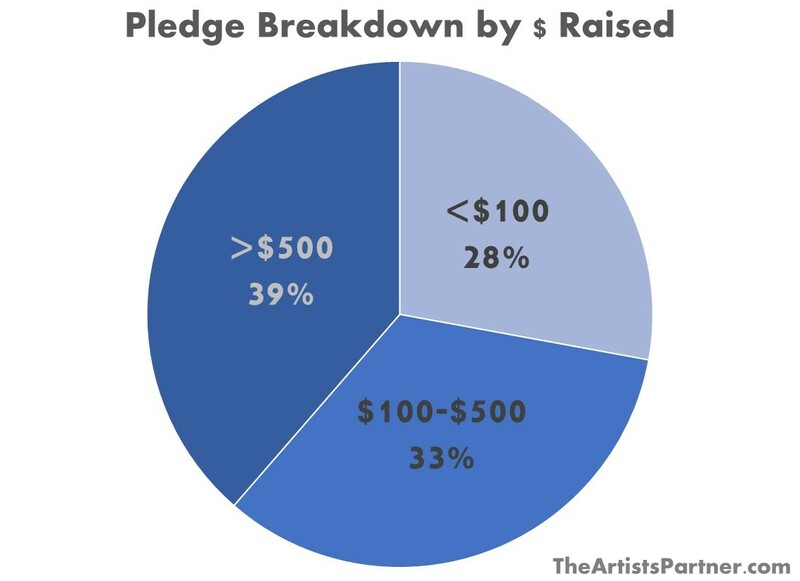 At first, when we look at the number of people likely to pledge more than $500 to your campaign, they seem like a small piece of the pie because they represent such a small percentage of the total people backing your campaign. This breakdown is the average for our clients. 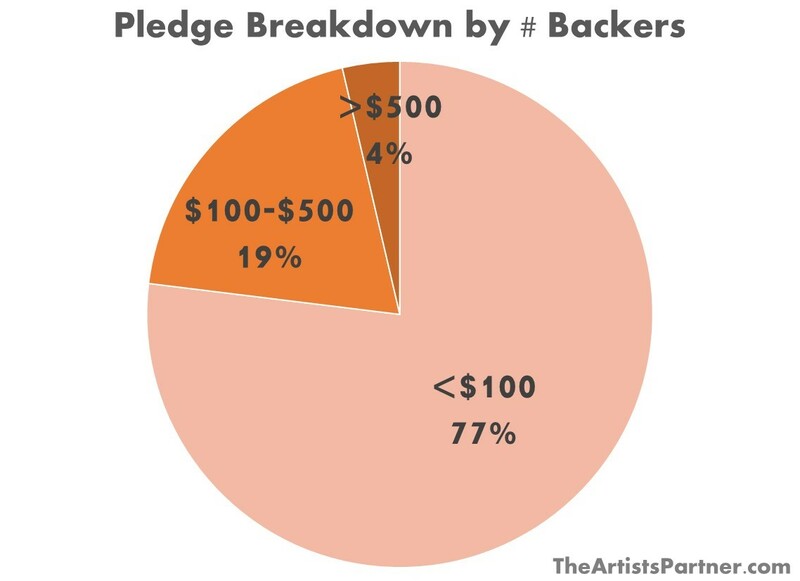 Typically, there are only 1-6 Benefactors, representing less than 5% of the people who have pledged. But they are key to your campaign’s success. Why? Because although they are your smallest group of backers, they represent the largest portion of funds raised. This handful of people get you almost 40% of the way to your goal. VIPs indeed! One-of-a-kind rewards. These backers are very unlikely to be strangers. These are fans, friends, and family who already know about your project, and they are excited about it. It’s worth thinking about what will be of value to each of them individually. Clients have offered special recordings of their favorite songs, a personalized DVD of a book reading, the opportunity to visit a closed film set, or admission to a private celebratory dinner. What will be of value to each of your Benefactors? Producer credit. Name your Benefactors prominently in the credits of your book, film, album, or other project. Offer to promote their project, business, or organization, too! Campaign draft sneak peeks. Your VIPs get to see your crowdfunding campaign while you are building it. Ask their advice, and incorporate their feedback. VIP soft launch invitations. This topic gets its own post, but to summarize, let’s say we’ve been promoting October 15 as the day your campaign goes live. That’s the day we’ll broadcast it publically. But what the public doesn’t know is that we’re actually going to quietly launch it on October 14. Your VIPs get an exclusive invitation to the soft launch, and first rights to your one-of-a-kind rewards. Private bonus rewards. Almost always, there will be draft copies of your project: proofs of books, rough cuts of films, play dress rehearsals. Your VIPs get free first rights to these, as well. VIP launch “Red Carpet” treatment. Whether it’s your film premiere, your book launch party, or opening night of your play or concert tour, give your Benefactors the “Red Carpet” treatment. Thank them personally and publicly. Make sure you treat your Benefactors right – they are key to the success of your crowdfunding campaign! If you’d like a free analysis of your crowdfunding plans for your project, please fill out our Artist Questionnaire. We typically respond within two weeks. We look forward to hearing about your project! These VIPs are so important, they each get their own post. This post is dedicated to your Influencers. Influencers are people with a platform to communicate with others about your project. They have a popular newsletter, radio show, or blog; they may have a large and engaged social media following. Your Influencers help you get the word out about your campaign. This becomes increasingly important the more money you want to raise. If you’ve been to our homepage, you know that on average most campaigns (62%) fail. In this post, we take a closer look at how much money the 38% of campaigns that succeed raise. 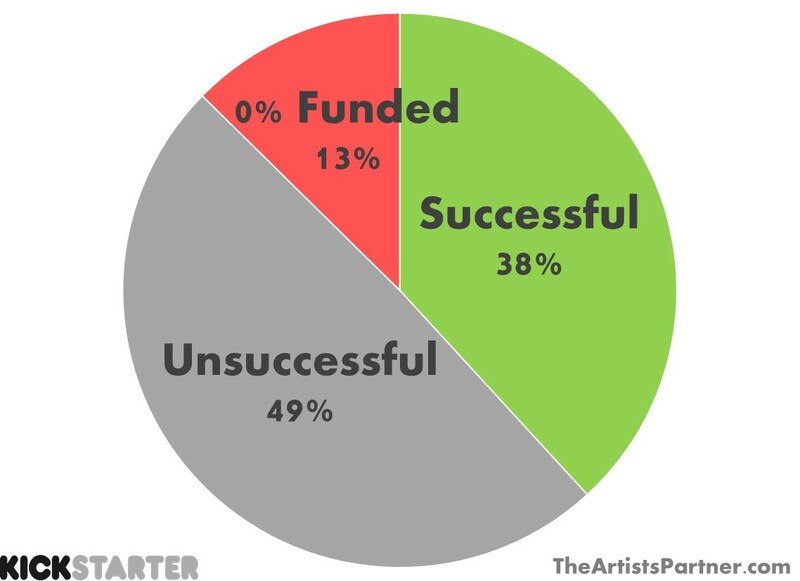 Most successful Kickstarter campaigns raise less than $10,000. 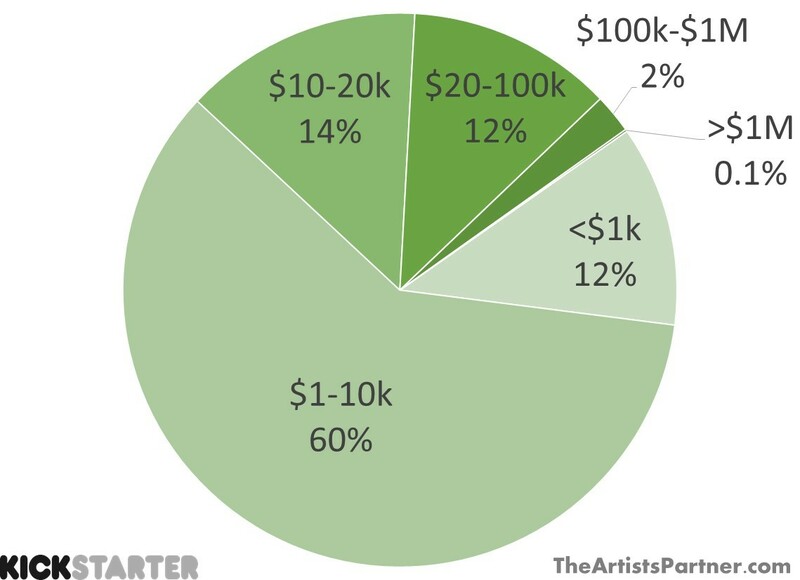 This is a reasonable goal for most artists to whom we talk (See our post on Setting Your $ Target). To approach and get over the $10,000 hump, though, the outreach numbers start piling up quickly: an email list thousands strong, a social media following tens of thousands strong, and multiple big ticket Benefactors. This is a major hurdle. It takes time to grow an email list from 250 to 2,500 people who will be excited about your project and reasonably likely to participate in your crowdfunding campaign. This is where the Influencers come in. An example: Let’s say you’re recording a Thrash Metal album. You have a Facebook page with 200 likes. And let’s say your uncle runs the #1 classical music radio show in the country, listened to by a million people. Let’s also say your aunt has a popular local metal blog with 2,000 subscribers, where she rates and reviews the metal shows she attends each weekend. Your uncle may be more “influential,” measuring numbers of listeners, but your aunt is more likely to be your Influencer because she is talking to the audience that will enjoy your project. Get in touch with your aunt six months ahead of your campaign launch. Do an interview. Send her sample tracks. Ask her to do a special post the week your campaign launches. Assuming she agrees, you now have 10 times the number of people who are open to hearing your music and listening to your message. There is no single, simple answer to the question of who the Influencers are for your campaign. But it’s worth considering now whom you know – or should get to know – who can speak directly to your target audience. If you’d like a free analysis of your crowdfunding project, please fill out our Artist Questionnaire. We typically respond within two weeks. We look forward to hearing about your project! Because they’re so important, Influencers and Benefactors each get their own post. This post is about the first group of your VIPs: Day 1 Backers. Your Day 1 Backers are important, because there is a powerful psychological negative embedded in a campaign that has “$0 / 0% Funded” plastered across the top of the page. Every campaign starts at zero. And an almost unbelievable 13% of Kickstarter campaigns – over 27,000 – end at zero, too, without a single person ever backing it. How does this happen? It’s an explanation similar to the house that has had the for sale sign in its yard too long. At a certain point, the public starts thinking there’s something wrong with your campaign, just by virtue of the fact that no one has yet backed it. This inertia becomes harder and harder to overcome as each day passes. So, have a handful of people lined up who consider it an honor to back your project on Day 1. These are the friends, family, fans, and colleagues who have known about your project since its early days. They can’t wait to have a copy of your book or album or a ticket to your show in their hands. Make sure they know months in advance that your Kickstarter or Indiegogo campaign is coming. They might pledge a little; they might pledge a lot. The role of your Day 1 Backers isn’t about the money. Their role is all about early momentum – they don’t require any extra convincing to support you. They’ve already bought into your idea, and they want you to succeed. They will convince other people who don’t know you or your project jump onto the bandwagon when they give your project that all-important boost from 0% to not-0% on Day 1. A sneak peek at crowdfunding campaign drafts. These people are excited about your campaign – so they get a back stage pass to tour it before it goes live to the public. Their advice is requested on video, copy, design, and rewards. Their voice is heard and reflected in the campaign. An invitation to be on your team. Creating a team is a big enough topic to get its own post, but in brief, these people are excited about your project! Why not ask them to join your team? A VIP soft-launch invitation. This topic gets its own post, too, but to summarize: Let’s assume we’ve been promoting October 15 as the day your campaign goes live. That’s the day we’ll broadcast publically. But what the public doesn’t know is that we’re actually going to quietly launch it on October 14. Your VIPs get an exclusive invitation to the soft launch, and first rights to special rewards. Private bonus rewards. Almost always, there will be draft copies of your project: proofs of books, rough cuts of films, play dress rehearsals. Your VIPs get first rights to these benefits. These will be the people who start that word-of-mouth spark when your project – not your crowdfunding campaign, but the actual project you’re funding – goes live. The second biggest surprise our clients face when we start working is how long it takes to prepare for a crowdfunding campaign. The biggest surprise is the gap between their project budget and the amount of money they are conceivably going to raise from their current network. Proper preparation is one of the key reasons our clients have a 97% success rate as compared to the 38% industry average. 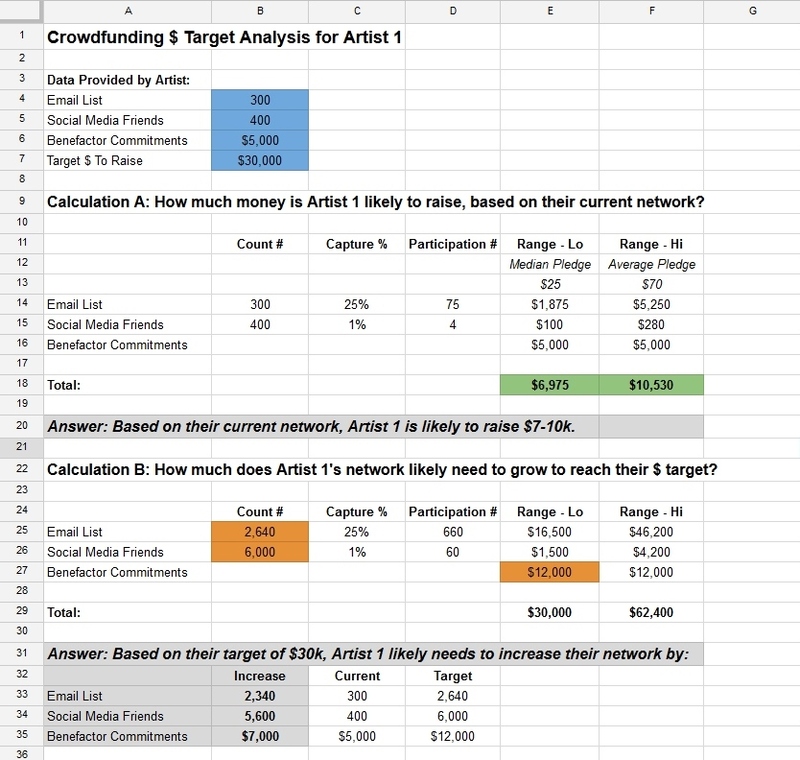 So, how do we prepare for a crowdfunding campaign? 1. We pick a good launch date. Ideally, we’ll begin working with a client in April (or earlier) for an October launch, or in November (or earlier) for a May launch. 2. We budget enough weekly time. A typical time commitment starts with a few hours per week several months before the campaign, sloping upward to 10+ hours per week in the month before the campaign. 3. We follow a detailed calendar of task deadlines. April – Network evaluation and $ target analysis. Whom will you invite to your campaign, and how? How is your network contact information organized so that you can engage efficiently? Who will back your project on Day 1? Who will be your Influencers, and help to spread the word? Who will be your significant Benefactors, and pledge more than $500 to the project? 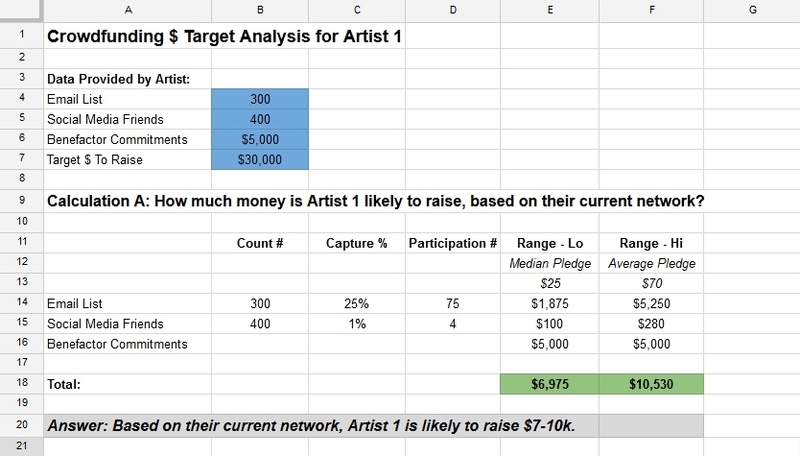 Based on your network, what is a reasonable target $ for the campaign? May – Communication program begins. How will you engage your Day 1 Backers? What do your Influencers need to communicate about your campaign? What will be of value to your Benefactors, and how will you engage them? What is your email communication strategy? What is your social media communication strategy? Rewards for backers – descriptions, pricing, shipping considerations. Keep your Day 1 Backers, Influencers, and Producers informed and engaged. September – Communication ramps up. Ensure your Day 1 Backers, Influencers, and Benefactors are engaged and ready to roll on launch day. Begin social media communication plan. Meet with key people in person to get their feedback on the campaign and commitment to participate. October – Campaign is live! If it seems like a lot… it is. But proper planning is a big key to crowdfunding success once you hit the launch button and your campaign is live! If you would like our recommendation on when to launch the crowdfunding campaign for your project, please fill out our Artist Questionnaire. We typically respond within two weeks. We look forward to hearing about your project!